The only important monthly statistic released this week was saved for last. September was the first month all this year that, excluding the census, jobs were lost. -18,000 to be exact. As I pointed out in a brief comment yesterday, there is a real divergeance between the BLS's Establishment survey, which is the source of that number, and the Household survey, in which the Census Bureau showed +141,000 jobs being created. There is about a 1,000,000 job difference so far this year in the two surveys! A few notes, contra most commentary. The benchmark reduction of -330,000 jobs covered the period of March 2009 to March 2010. 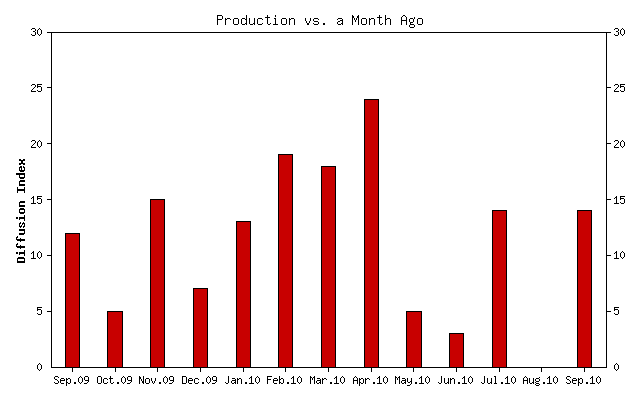 If it is like last year's revision, the lion's share of that reduction will be in the first part of that period, i.e., at the end of the recession and immediately afterward in 2009. It may not impact 2010 more than trivially. We shall see. Secondly, the internals of the BLS report actually showed continued widespread slow gains in jobs, with two important exceptions: local government jobs, and construction. These are precisely the two areas where stimulus was withdrawn or not renewed earlier this year. As a result, new home sales tanked, and state and local governments have been forced to lay off thousands of workers. Layoffs that otherwise would have happened in 2009 are happening now -- in the case of state and local employees (-76,000), these layoffs can be blamed squarely on Congressional idiocy. Manufacturing hours worked declined .1 hour. This will subtract from the LEI, but September's LEI should still be positive. Otherwise, the manufacturing data showed a continued slowdown, but still growth. Let's turn now to the high frequency weekly data. These continue to generally be positive, but were more mixed this week. The Mortgage Bankers' Association reported that its Refinance Index decreased 2.5% from the previous week, and has now declined for 5 straight weeks, despite record low rates. The seasonally adjusted Purchase Index, however, increased a whopping 9.3% from one week before. This is quite a bounce, but don't celebrate yet, as it was probably due to "a desire by borrowers to get applications in before new FHA requirements took effect October 4th, which included somewhat higher credit score and down payment requirements.” Still, it's nice to see purchase activity has a pulse. The ICSC reported same store sales for the week ending October 3 fell -0.8% week over week, but were up 2.4% YoY, a weak performance compared with recent gains. Shoppertrak reported that for the week ending October 2, YoY sales rose a pathetic 0.2%, and 2.3% over the previous week. On a monthly basis, the ICSC said that September same store sales rose 2.6% YoY, but this rate of growth is below the 3% YoY growth rate during the summer. Since retail sales started to grow meaningfully in the latter part of last year, in part this simply shows more challenging YoY comparisons. Nevertheless, retail sales appear to be reflecting the anticipated economic slowdown in growth. Gas prices rose 4 cents to $2.73 a gallon, and at usage at 8.989 million gallons was slightly below last year at this time. Gasoline stocks continue to be 10% above their normal range for this time of year. This also reflects a slowdown, and the fact that Oil rose close to $85 a barrel this past week is a bad omen, as the price of Oil continues to act as a choke collar on growth. The BLS reported 445,000 new jobless claims. The four week average declined again to 456,000, close to its lowest reading all year. The decline in new jobless claims is an important bright spot in the LEI. Railfax once again showed rail traffic improving last week, and improving at a rate similar to one year ago. Economically sensitive waste and scrap metal improved, but still is running no better than last year's levels. Auto loads increased compared with last year. The American Staffing Association reported that for the week ending September 26, temporary and contract employment increased to 100.0, once again making a two year high. Temp staffing is near 2006 levels, but not a 2007's yet. If this trend continues, in a few month we should see more permanent hiring. M1 rose 1.5% last week, and also increased about 1.5% month over month, and up about 6.5% YoY, so “real M1” is up 5.3%. M2 increased again 0.3% last week, +0.7% month over month, and up 3.3% YoY, so “real M2” is up 2.1%. The important news here is that "real" M2 is now close to breaking out of the "red zone" of +2.5%, which would give us the "all clear" as to any "double dip." Weekly BAA commercial bond rates declined last week, down .08% to 5.58%. Rates falling while stock prices rose remains a good sign. Five days into October, the Daily Treasury Statement is up $41.7 B vs. $38.3 B a year ago, a gain of ~6%. For the last 20 days, receipts are up $128.4 B vs. $122,5 B a year ago, a gain of about 4.9%. The weekly indicators were mixed this week. Improving jobless claims, rail loads, money supply, and temp staffing were offset by Oil prices, and weak retail. Slowdown, but no double-dip, remains the story. What is the Structure of Unemployment? The "structural vs. low demand" debate has been going on for awhile. But the national figure hides a sharp divergence between rust-belt manufacturing states in the north and east, where unemployment is high but new job losses have fallen, and Sunbelt states in the south and west, where the labour market remains in flux. 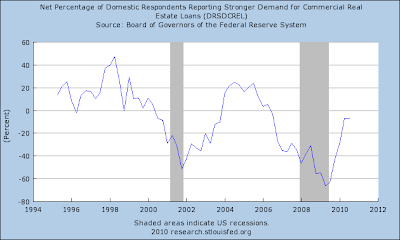 This pattern provides a clue to a vital policy debate: does high unemployment just reflect weak demand, in which case the Federal Reserve might be able to do something about it by launching a new round of asset purchases? Or is it a structural problem, showing that workers are in the wrong place or have the wrong skills, in which case monetary policy can do little? Eric Rosengren, the president of the Boston Fed, noted that across the country job losses have been spread across a range of different industries. “If all the loss was in construction then that’s a structural change, but that’s not the pattern we’ve seen,” he said in an interview with the Financial Times. 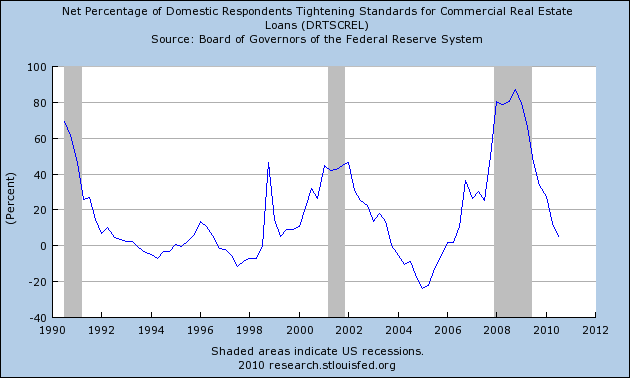 Mr Rosengren’s colleague, Narayana Kocherlakota, Minneapolis Fed president, has made the reverse argument in speeches. “Firms have jobs but can’t find appropriate workers. The workers want to work but can’t find appropriate jobs,” he said. Mr Kocherlakota pointed out that the number of job openings has recovered but unemployment has not fallen in proportion. That implied something was preventing people from taking the available jobs. Mr Kocherlakota estimated that up to 2.5 percentage points of today’s unemployment was the result of the mismatch between jobs and workers. In the rust-belt states much of the surge in unemployment was caused by the woes of the car industry. That rush of job losses has ended but it almost certainly left behind some workers whose location and skills meant they would struggle to find jobs, even if there were strong demand for labour. That was probably true before the recession as well, however: Michigan had a 7 per cent unemployment rate during the boom of 2006-07. Here is a link to the Boston Fed's study. Here is a link to the Minneapolis Fed's study. All this week I've been looking at different economic sectors to see where growth will come from. The problem the economy now faces is no one area is strong enough to drive growth. 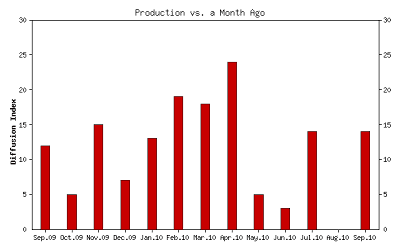 Looking at PCEs, there is little reason to think we'll see quarter to quarter growth over the approximately 2% we've seen for the first four quarters this year. Between a high savings rate, high unemployment and paying down debt, it appears consumers are already at their maximum rate of PCE spending. The good news here is PCEs account for 70% of growth, so the largest part of the economy will expand; just not at a robust pace. Invesetment is also a dud. 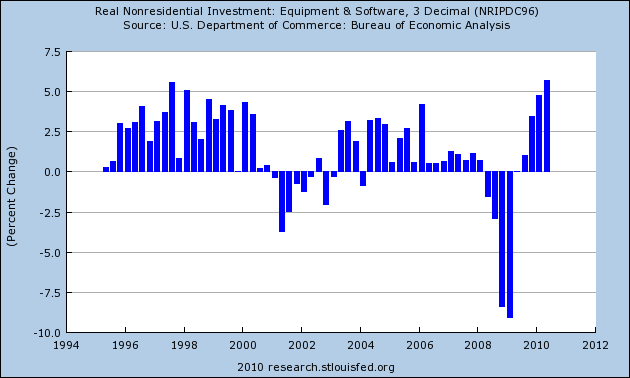 Any real estate investment is pretty much out for the foreseeable future, leaving equipment and software spending. And while the growth in this area has been robust, it only accounts for 7.5% of GDP. The good news here is businesses are sitting on a ton of cash and have demonstrated they do not want to hire employees, meaning this area of investment spending should continue to benefit. Manufacturing is clearly slowing. While the overall national numbers are still showing growth, they are just barely positive. The good news here is a cheap dollar should help exports, which -- along with the strong growth in emerging economies -- should prevent this sector from falling into the abyss. But the slowdown across the entire Eastern seaboard indicates this sector is taking a hit from decreased demand somewhere. Services are growing, but weakly. The regional Beige Book surveys described increases as "moderate" or unchanged. It appears that people are using services only when necessary, and then are haggling over cost. So, in short, there is growth, but it is extremely weak. I could swear this months report is a carbon copy of the basic situation from last month's report. Basically, modest private sector hiring is offset by big losses in the government sector. Let's look at the details, starting with the household survey. The civilian, non-institutional population (everybody over 16 who isn't in jail or in the military) increased 223,000. This numbers is the denominator in a a lot of calculations. The civilian labor force (all employed and unemployed persons) increased 48,000. As such, the participation rate -- the percentage of people who are "participating" in the work force was unchanged at 64.7%. The number of employed people increased 141,000 while the number of unemployed decreased 93,000. Total, non-farm employment decreased 95,000, but that is the result of a loss of 159,000 in the government employment area. Goods producing industries lost 22,000, largely as a result of a 21,000 drop in construction employment and a 6000 drop in non-durable goods employment. service sector employment increased 86,000, which was largely caused by an increase of 32,000 in health care and social services and a 38,000 increase in leisure and hospitality employment. Government employment dropped by 159,000, which was evenly split between federal (76,000) and local (76,000). Average weekly hours remained constant, average hourly earnings increased .01 (a penny) and average weekly earnings increased from 639.52 to 639.85. The index of aggregate weekly hours increased from 99.5 to 99.6. 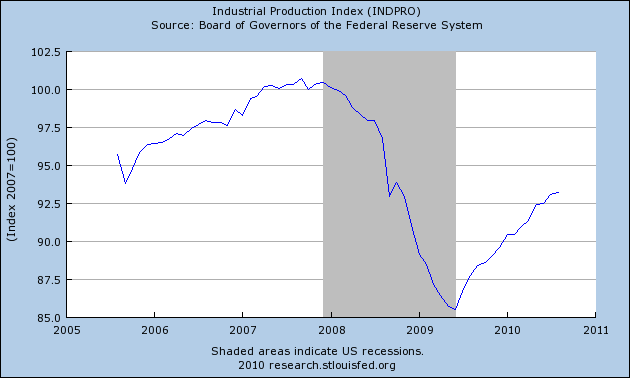 As I said up top, this sure looks like the last employment report. On a scale of 1-10, this is a 3.5 at best. There is some hiring, but nowhere near enough. NDD here: Two things about the September report jumped out at me. (1) is the continuing local government job losses. As I have noted before, the refusal to extend budget help to the states means that layoffs that would have happened a year ago, are happening now instead. In contrast, virtually all other areas showed job gains. 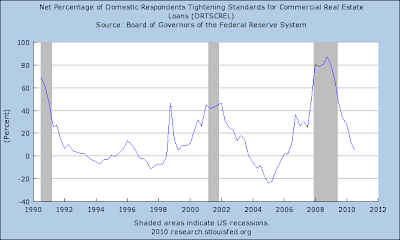 (2) is the continuing divergeance between the Establishment and Household surveys. The former showed -95,000 while the latter showed +141,000. The Establishment survey is showing less than 650,000 jobs added to the economy all year, while the Household survey shows almost +2,000,000! This is a huge divergeance. First, aside from the strong rally on Tuesday morning, the price action for the last two and a half days has been extremely limited. Traders are obviously waiting for today's employment report. 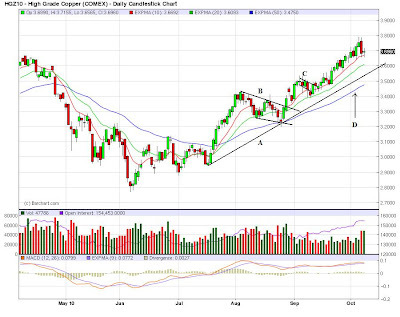 Yesterday, prices opened higher (a), but quickly fell and consolidated in a downward sloping pennant pattern (b). after selling off and bottoming, prices rose and consolidated in two downward sloping pennant patterns (c and d). However, the overall range of the price action was about a point (15.30 - 16.55). This is a very tight range. The bad news is the markets don't feel strong. 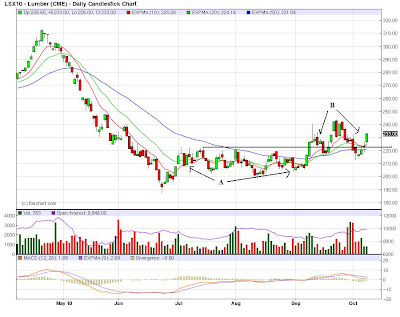 Lumber has formed a strong base (A) and has broken through resistance (B). But there is no strong upward momentum in the chart; instead, prices are meandering at the next highest level. 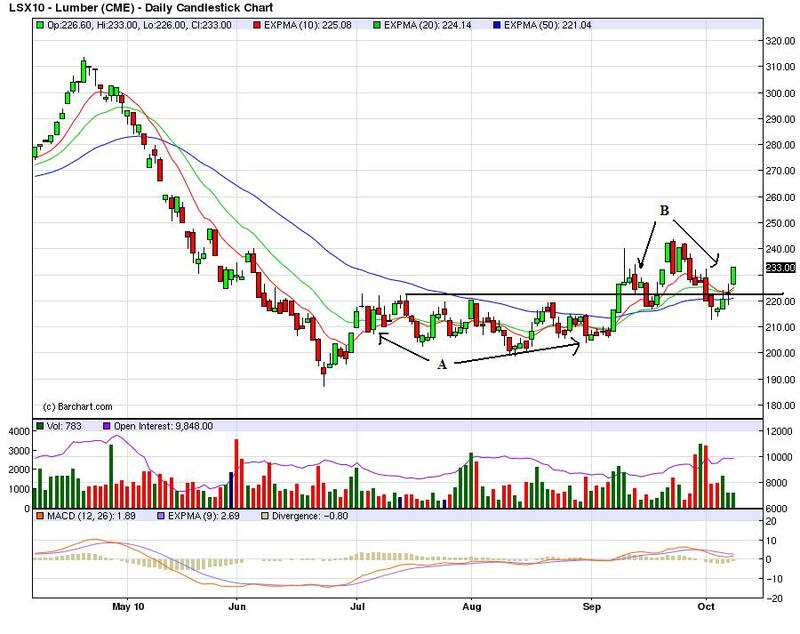 Copper is still in a strong uptrend (A), which has continued higher after several consolidation areas (B and C). In addition, the EMA picture is strong with all the EMA moving higher and the shorter EMAs above the longer. This is something I've touched on before (see here and here). Treasury Secretary Timothy F. Geithner called for cooperation to rebalance currency markets and warned of a “damaging dynamic” of competitive weakening that could limit global growth. Global exchange-rate policies are a source of contention ahead of this week’s meeting in Washington of the International Monetary Fund, World Bank and Group of 20 officials. Brazil’s Finance Minister Guido Mantega last week warned of a “currency war” as governments in Asia and Latin America seek to spur exports and economic growth. This is the latest development in a multi-pronged story. I believe it started with the Brazilian statement regarding a currency war, although the US House's action on raising tariffs on Chinese imports may have also started the wave. Now we have the US Treasury Secretary entering the fray. I think it's great that this issue is now out in the open. "The NMI (Non-Manufacturing Index) registered 53.2 percent in September, 1.7 percentage points higher than the 51.5 percent registered in August, indicating continued growth in the non-manufacturing sector at a faster rate. The Non-Manufacturing Business Activity Index decreased 1.6 percentage points to 52.8 percent, reflecting growth for the 10th consecutive month, but at a slower rate than in August. The New Orders Index increased 2.5 percentage points to 54.9 percent, and the Employment Index increased 2 percentage points to 50.2 percent, indicating growth in employment for the third time in the last five months. The Prices Index decreased 0.2 percentage point to 60.1 percent, indicating that prices increased in September at a slightly slower rate. According to the NMI, 11 non-manufacturing industries reported growth in September. Respondents' comments continue to be mixed about business conditions, with a slight majority reflecting optimism." I've always assumed they include various anecdotal statements because they are representative of the industry or a group of statements. The above statements use the word "stable/flat" is pretty prominent. In other words, things are OK, but not great. No one is saying, "people are literally kicking the door down to buy something." 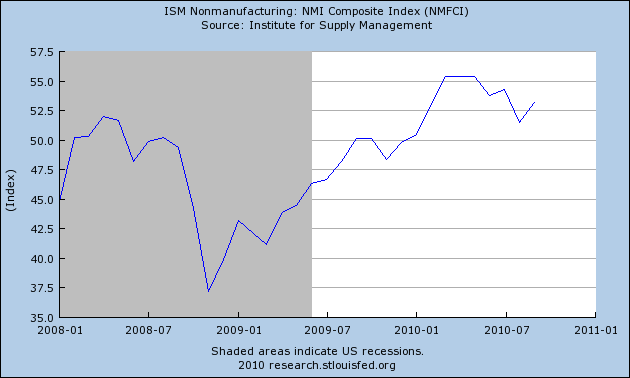 Like the ISM manufacturing index, the non-manufacturing index bottomed at the end of 2008 and rose until 2010. Over the last few months we've seen it slip, but it is still showing readings above 50 indicating expansion. 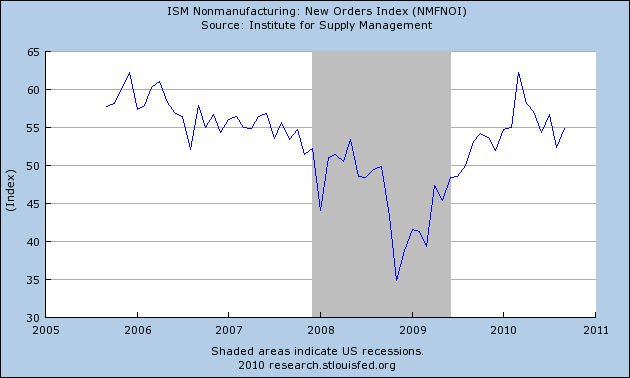 The new orders index is still above 50, but it is also in a clear downtrend. Activity was largely stable or up slightly for professional and other nonfinancial services. Providers of information technology (IT) services such as computer software saw substantial revenue and sales gains in the Boston and Kansas City Districts, with increased demand for IT labor reported in Chicago as well. Demand for professional services such as accounting held largely steady, with Minneapolis and Dallas noting increases for selected types of consulting and legal services. Conditions were mixed for providers of real estate services, as heightened appraisal activity for refinancing purposes was offset by depressed home sales and consequent limited needs for agents and brokers. Demand for temporary staffing services remained on an upward trend, with increases noted by Boston, Philadelphia, Richmond, and Minneapolis, although Chicago pointed to a slight softening during the reporting period. Reports from the health-care sector were mixed: Boston, Cleveland, and Chicago reported ongoing increases in demand for health-care workers, while Philadelphia indicated a flattening in demand for health-care services and San Francisco noted a decline in the frequency of elective procedures and routine tests. Demand for shipping and transportation services generally expanded, although according to Cleveland the pace of growth slowed and contacts there expect little change from existing volumes in the near term. Boston: Software and information technology contacts in the First District report that business conditions continued to improve. Year-over-year revenue increases ranged from mid-single digits to 15 percent in the most recent quarter. Half of contacted firms increased their headcounts and another was "on the cusp of hiring." Philly: Service-sector firms generally reported minimal gains or flat rates of activity since the previous Beige Book. A large business services firm reported that client companies were not contracting for as much business as they had indicated earlier in the year. Several health-care organizations noted recent flattening in activity that is interrupting a long growth trend. In contrast, some temporary employment agencies noted that demand had picked up recently. Looking ahead, most of the services firms contacted for this report expect growth to be slow for the rest of the year. Some have reduced their forecasts; as one contact said, "It looks like we were a little too optimistic earlier this year." Richmond: Services-providing firms also gave mixed reports. Contacts at healthcare organizations noted that demand was typical for the summer, while airport officials and electrical contractors saw a small increase in demand for their services. A telecommunications contact reported accelerating revenues, while several administrative-support firms cited flat or slowing revenue growth. Local officials in Norfolk, Virginia noted that a recently announced shut-down of major military facilities would affect a large number of civilian contractors. Community leaders indicated that they will be vying for other military projects. Price growth slowed slightly at services firms in recent weeks, according to survey respondents. St. Louis: The District's services sector also has continued to improve since our previous report. Firms in the transportation, business support, telecommunications, and government services industries expanded existing operations and hired new employees. Additionally, firms in the restaurant industry opened several new facilities. In contrast, contacts in the business support services and janitorial services industries reported plans to decrease operations and lay off workers. Minneapolis: Activity in the professional business services sector increased since the last report. Contacts from the legal sector reported that billings during July were up from a year ago, especially for firms that deal with bankruptcies. A call center is expanding in South Dakota. Appraisers and other professional services firms that support home refinancing reported strong activity over the past month. Kansas City: Growth in transportation services moderated slightly from previous surveys but remained solid, and a major supplier of diesel fuel reported continued solid sales. Most high-tech services firms reported strong growth in sales, although a few contacts noted softened demand. Business firms' expectations for future sales eased somewhat from the previous period but remained positive. Dallas: Most staffing firms report that demand continues to grow at a solid pace, and is particularly strong for light industrial, sales, administrative, professional and technical workers. Placement activity continues to be mostly for contract work as employers are still hesitant to hire permanent staff. Near-term outlooks are optimistic, but respondents are cautious about the longer term. Accounting firms note that while demand for tax-related services has slowed seasonally and that for real estate and construction-related work remains nonexistent, there has been a pickup in transactional and consulting activity. Demand for legal services was largely unchanged during the reporting period, with the exception of an uptick in corporate demand for mergers and acquisitions-related activity. Demand for transportation services remains positive. Railroad respondents noted a broad-based increase in cargo volumes, with shipments of grain products recording the largest increase. Shipping firms said small parcel cargo volumes rose, while large freight shipments declined during the reporting period. Intermodal transportation firms reported a modest increase in shipments. Airline traffic was flat to slightly down since the last report, but is stronger than a year ago. The outlook is for continued stability in air travel demand. San Francisco: Demand for services improved modestly on balance but remained lackluster overall. Demand for professional, media, and entertainment services was mixed across sectors but appeared to be largely stable at low levels on net. Providers of energy services reported stronger demand for industrial use, with the exception of wood products. Contacts from around the District noted increased business travel and tourism activity, as reflected in higher visitor volumes, hotel occupancy rates, and airline passenger miles, although visitor spending remained weak. Providers of health-care services reported that demand slipped somewhat, which they attributed in part to rising postponements or cancellations of elective procedures and routine tests by individuals who lack health insurance. Overall, the general tone is one of growth, but muted. Growth is between "lackluster" and growing, but the emphasis seems to be on caution. People are seeking services, but at a reduced pace. Stocks are now above the 61.8% Fibonacci retracement level. There is very little overhead resistance aside from round numbers at this point (I'll touch on the recent action below). At the same time, the 7-10 year part of the curve is also rallying. 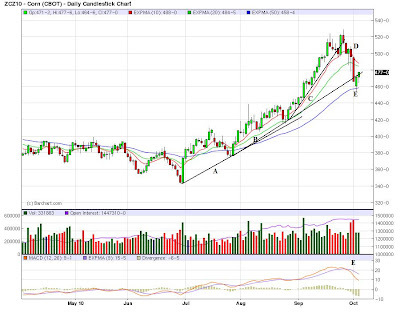 While it has broken the primary uptrend (a) it has now formed a second uptrend (b). The TLTs -- the long-end of the Treasury curve -- are also rising. They are also above key support levels (b). S0 -- at the macro-level, both stocks and bonds are rising. The move into stocks indicates there is an increased risk appetite on the part of investors. In addition, the lower yields on Treasuries is driving investors to seek higher dividends and more capital appreciate in stocks. The rise in bonds indicates two things. First, investors don't see the Fed lowering rates anytime soon. In addition, inflation is also not a concern; if it was, people would be moving out of Treasuries. The dollar's chart also tells us that traders don't thing the Fed will be raising rates anytime soon. After forming the head and shoulders formation, prices broke through the neckline and have moved lower at a strong pace. But part of it is also the rise of demand from growing industrial economies. Overall, the markets are fairly bullish for the economy: the rise in equities indicates an increase in risk appetite; the rise in Treasuries indicates that traders think rates will stay low for the foreseeable futures; the lower dollar bolsters the interest rate argument and helps exports and commodities are rising because of increased demand. The price of tin has jumped to a new high, making the metal, widely used in electronic goods, the first base metal to surpass the peak it hit during the boom years before the global financial crisis. The record comes as resurgent demand, particularly from Asia, is being met by sluggish supply in all the industrial metals, driving prices higher. Copper, the red metal used in electrical wiring and piping, rose above $8,200 a tonne for the first time in two years, and there is widespread expectation in the industry that it will post an all-time high above $9,000 within months. Even aluminium, the laggard of the group whose supply is plentiful, has risen 25 per cent since June and is trading near a two-year high. This bodes well for manufacturing in the future, as it indicates demand is increasing. Governments are risking a currency war if they try to use exchange rates to solve domestic problems, the head of the International Monetary Fund has warned. The comments by Dominique Strauss-Kahn came before the yen fell as a result of the Bank of Japan shifting towards quantitative monetary easing, cutting its key interest rate and proposing a new fund to buy government bonds and other assets. “There is clearly the idea beginning to circulate that currencies can be used as a policy weapon,” Mr Strauss-Kahn told the Financial Times on Monday. Capacity utilization. 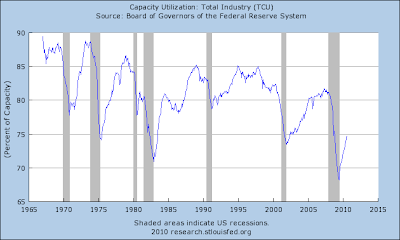 However, note how far capacity dropped; this was the steepest loss of capacity in the last 50 years, indicating how severe the industrial contraction was. 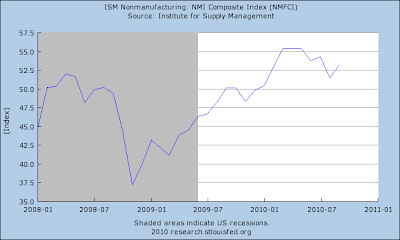 The ISM number started to rebound in early 2009, and continued higher until earlier this year. 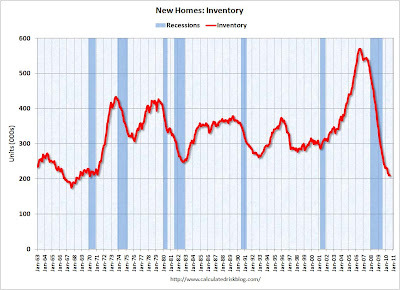 The number has moved lower for the last few months; however it is still above 50 indicating an expansion. In addition, the number reached an incredibly high level, indicating there was nowhere to go but down. 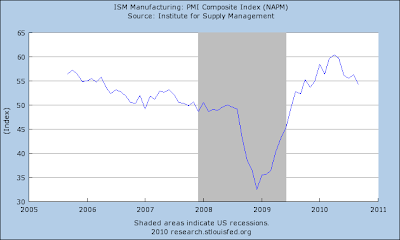 However, there are other signs of a manufacturing slowdown in the data. Overall durable goods orders have been down three of the last five months. Also note that aside from two big gains, this series has been printing right around zero. However, it is important to remember that aircraft orders are part of this series, which tend to have a very disruptive effect on the numbers reported. However, regardless, the numbers are getting weaker and have been for the last few months. 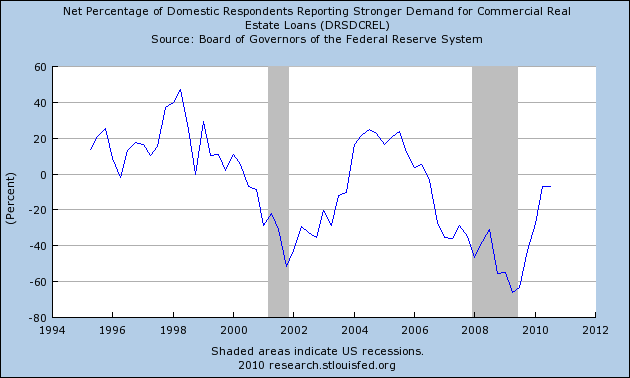 In addition, the regional Federal Reserve surveys are showing a slowdown. The Empire State Index printed strong numbers earlier this year, but has since fallen back to just about 0. This is still an expansionary reading, but obviously not very strong. The Philadelphia Manufacturing Index moved below 0 last month, but is currently right around that level. The Richmond index is also moving lower, although still positive. The Texas manufacturing index has been teetering just above 0 for the last year. The Kansas City Fed's number printed a decent number last month. The Chicago Fed's Midwest index is still increasing, although it is doing so from very low levels. These numbers show that the Eastern Seaboard's manufacturing is slowing, but the mid-west's is fair and Texas' is borderline. 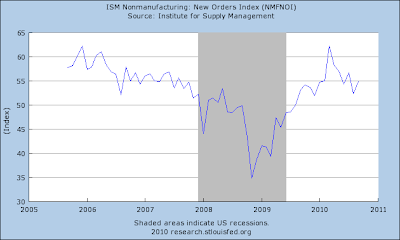 The overall slowdown in durable goods orders indicates the manufacturing sector is slowing. However, the overall ISM readings and numbers from the Midwest should be enough to keep manufacturing from contracting at a strong rate. I think these numbers indicate a level right around 0 is the worst case scenario going forward. On the daily chart, yesterday's price action was incredibly important because prices broke through key resistance on several fronts. For the last week or so, equities and bonds have been competing for investor's attention, with bonds taking just enough away from equities to keep equities from moving higher. Yesterday may have ended that situation. Also note there is a ton of empty space above the SPYs, indicating prices have room to run. Yesterday, prices gapped higher at the open, and continued higher all day. Along the way, there were several consolidation patterns (b). This is a very strong chart. The primary market holding stocks have is the bond market. Notice that while prices are still below the main uptrend, they are still clustering in a high position, giving no indication of selling off. So long as fixed income can pull money away from equities, a possible upward break exists on the equity markets. The dollar is in a clear downtrend. 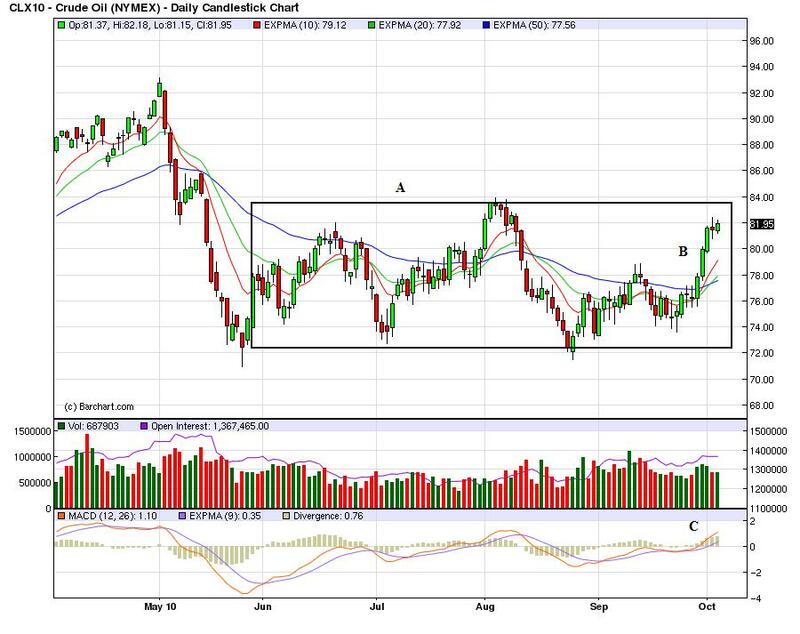 In the last ten days, there have been three downside gaps (a, c and d) and one big move lower during the day. This has very bullish implications for the commodities markets. Factory orders fell back in August but were skewed by a month-to-month dip for aircraft which, based on a run of order announcements from Boeing, looks to swing higher in September. Factory orders fell 0.5 percent in August yet were up 0.9 percent excluding transportation, which is the category that includes aircraft. Details show a 1.5 percent decline in durable goods (revised from minus 1.3 percent) with the first reading on non-durables up 0.3 percent on strength in chemicals. U.S. manufactured goods orders decreased by 0.5% to $408.94 billion, the Commerce Department said Monday. Commercial airplanes drove the decline; excluding transportation, all other factory orders rose. The report had positive data. A barometer of business capital spending increased; non-defense capital goods orders excluding airplanes rose by 5.1%. The big problem with this report is Boeing, which can really play with the numbers. Excluding transportation, we're seen the following numbers for new orders for the last three months: -.6%, -.9% and up .9%. That is two monthly declines, although this months number was strongly higher. Excluding defense, we've seen the following numbers for new orders for the last three months: -.5%, .5%, -.5%. For machinery, we've seen the following numbers for new orders for the last three months: 4.1%, -9.8%, 5.2%. These only account for 6.57% of all orders, but are an indicator for future business investment. New orders for computers and electronic components. have printed the following for the last three months: -.9%, -.3% 3.7%. These only account for 6.94% of new orders. 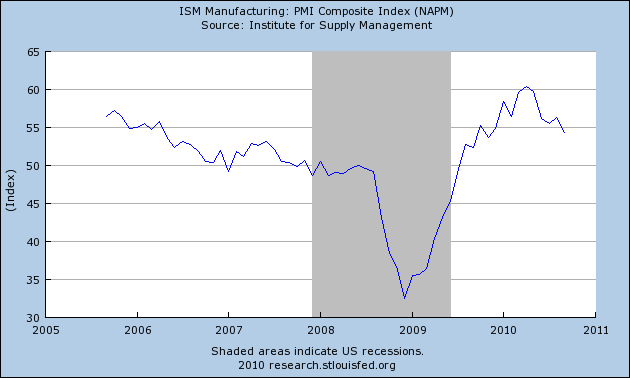 Overall, this number points to a slowing in the manufacturing sector, but hardly a collapse. The world’s leading countries should agree a new currency pact to help rebalance the global economy, a leading association of financial institutions has urged. Mr Dallara, who as a US official worked on the 1985 Plaza Accord which co-ordinated international action to strengthen the yen against the dollar, called for a more sophisticated updated version of such an agreement. This should include stronger commitments to medium-term fiscal stringency in the US and structural reform in Europe. “Exchange rate understandings are of little use on their own,” he said. European policy makers on Tuesday ramped up pressure on China to allow its currency to strengthen, claiming the yuan's weakness threatens Europe's economic recovery. Their direct language followed their meeting with Chinese Premier Minister Wen Jiabao as part of the Asia-Europe summit here and marked growing support from Europe for U.S. efforts to offset China's export advantage from the weak yuan, also known as the renminbi. Jean-Claude Trichet, president of the European Central Bank, departed from ECB practice of not identifying countries for criticism. "We noted that the evolution in terms of the effective exchange rate, also vis-a-vis the euro, was not exactly what we would have hoped ourselves," Mr. Trichet said at a news conference. "This exchange-rate flexibility is very, very much in the interests of China." Let's continue out look at where growth will come from by looking at the second part of the GDP equation: investment, which accounts for 14.8% of US GDP. Investment has three sub-categories: residential investment (housing), non-residential structures (commercial real estate) and equipment and software. The above chart shows the year over year rate of change in overall construction spending. 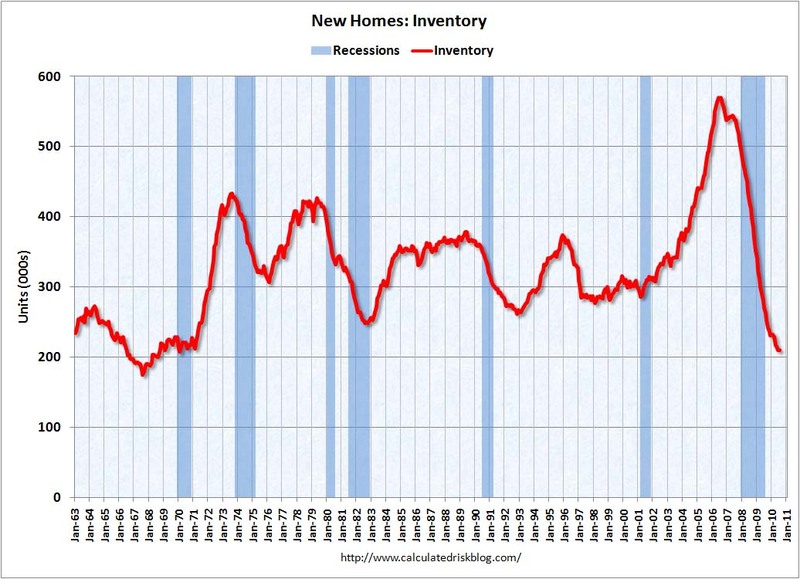 While the rate of decline as lessened, it is still printing negative numbers indicating that construction spending is still having problems. The month to month percentage change has been getting less bad, but is still in a very negative situation. Construction spending is composed of two data subsets: residential -- which accounts for 30.68% of all construction spending and non-residential which accounts for 69.31% of construction spending. Residential investment accounts for 22.33% of construction spending in the GDP equation and 3.3% of US GDP. Commercial real estate is 28.53% of investment spending in the GDP equation and 4.22% of total GDP. However, construction spending is incredibly important because of its ancillary benefits. Construction employs construction workers and increases purchases of durable goods. That's what makes these numbers so important. Notice that residential has started to print positive year over year numbers; it's commercial real estate that is in the doldrums, although it does appear the rate of decline has hit bottom. 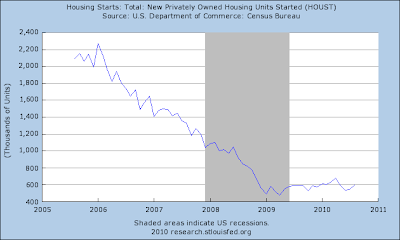 The bad news is the economy is weak and households are de-leveraging. So while a quick resurgence in new home demand could really provide a spark for the economy, the reality is that probably won't happen anytime soon. Regarding commercial real estate -- the largest part of construction spending -- change may be on the horizon. First, fewer and fewer institutions are tightening lending standards for commercial real estate. 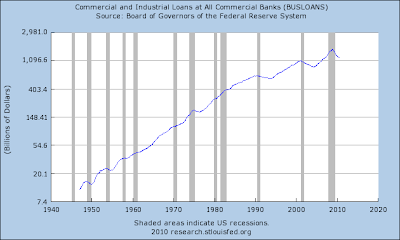 The total amount of C and I loans outstanding has decreased. However, also note that in the last two recoveries, this number decreased for an extended period of time into the recovery, indicating the current situation is not abnormal. So, the short version for real estate investment is it won't be a major player going forward. This leaves equipment and software investment. Equipment and software investment accounts for 50.74% of total investment spending and 7.5% of GDP. Some of this capacity may have to be replaced because it is no longer technologically valid. However, there is also a fair amount of unused capacity that can come back on line. 1.) Commercial real estate -- the largest component of construction spending may by bottoming, but it has a long way to go before it can play a meaningful part in the recovery. 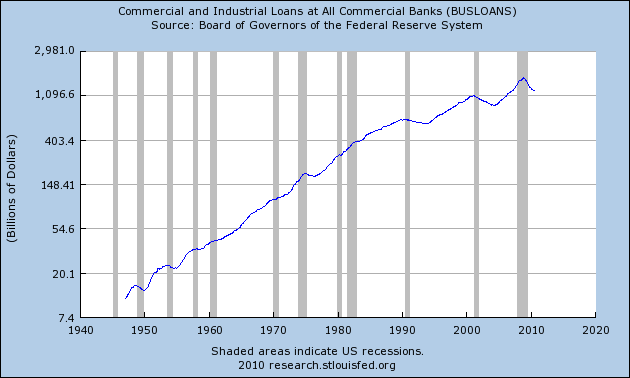 Current C and I loan delinquencies are high total C and I loans outstanding are decreasing. 3.) Equipment and software investment spending is picking up, but may be constrained by low capacity utilization. So, investment may add a touch to growth, but not a lot. Yesterday's price action was straightforward: prices declined in a disciplined manner in the morning (a) and then moved slightly higher in the afternoon (b). However, the afternoon's action was more of a bottom; there was a slight upward bias, but nothing very strong. Yesterday, prices gapped higher at the open (a) and then moved higher (b). This is the mirror image of the equity markets price action yesterday. 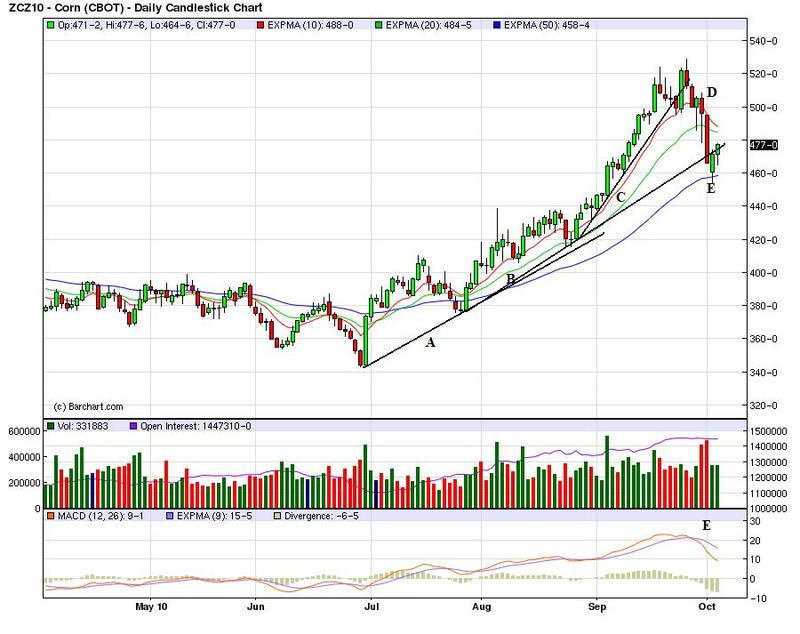 On the daily chart, prices are below the big, long-term trend line, but that's about it. The EMAs are still in a very bullish orientation -- the shorter are above the longer and all are moving higher. 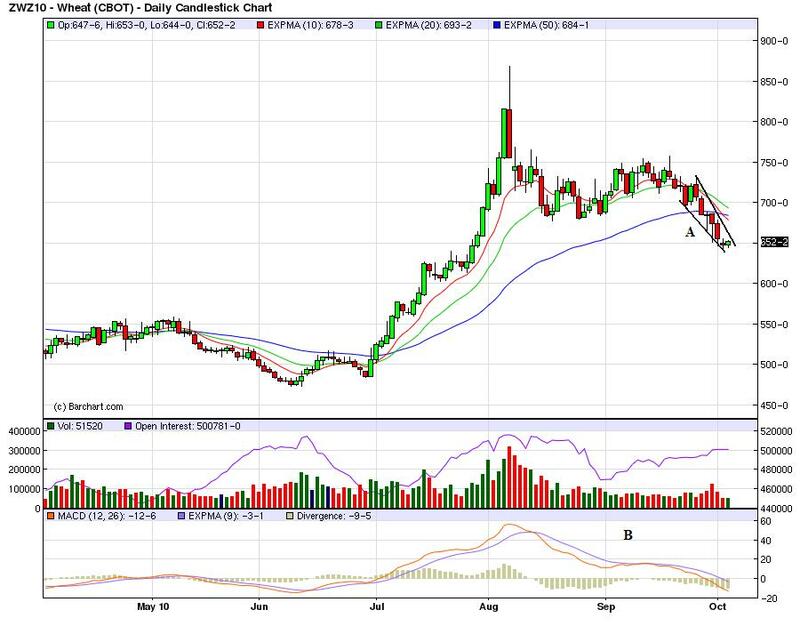 Last week, the USDA reported a larger corn crop estimate, which took the wind out of the corn market rally (which was also rallying in sympathy with Wheat because of the Russian drought). Notice that prices rallied in an increasingly sharper upward angle (A, B, and C) until they hit their latest peak. But we've seen prices move fairly sharply lower (D), now resting at/near the 50 day EMA (E). Also notice the MACD has also given a sell signal. Wheat prices have moved lower in a disciplined downward sloping pennant pattern (A). Also notice that momentum is decreasing (B). 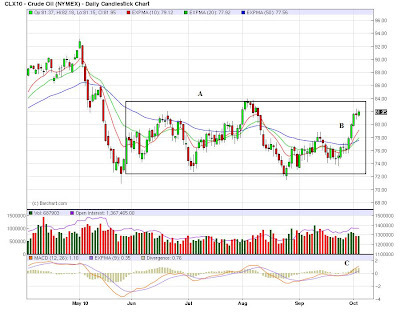 Although the oil market is still in a trading range (A) it has had a nice price bump over the last few trading sessions (B), along with a buy signal from the MACD (B). However, prices need to move above upper resistance of at least 84 before this becomes a bull market. And remember there is a tremendous amount of supply which is holding back the market.